Looking for quick, easy and affordable protein concentration analysis? Benchtop SPR can help. In our application note, we demonstrate how OpenSPR™ can be used as a concentration assay for determining the level of α-lactalbumin, an important protein in milk. Binding of α-lactalbumin to anti- α-lactalbumin at concentrations of 3000, 2000, 1000, 750, 500, 300, 200, 100, 50, 10, and 1 ng/ml. In a concentration assay, different concentrations of the target analyte are injected and the measured responses are plotted against the concentration of each sample to create a calibration curve. As the concentration of an analyte increases, the rate of binding to an immobilized binding partner also increases. The calibration curve is then used to determine the concentration of the analyte in a sample with unknown concentration. Why do we need to measure protein concentrations? Proteins are important to study because they form the basis of cellular function in plants and animals. Furthermore, protein concentration analysis is needed to determine the quantity and quality of protein and state of biological reactions. In addition, determining protein concentration is necessary before processing protein samples for isolation, separation and analysis by chromatographic, electrophoretic and immunochemical techniques. Different protein quantitation methods are appropriate depending on the accuracy required and the amount and purity of the protein available for your experiment. Choosing the optimal assay for determining the protein concentration in your sample will affect the overall success of your research. Why use SPR as a concentration assay? Surface plasmon resonance (SPR) can be used as a very precise method for determining the active concentration of a biomolecule on the basis of a high affinity interaction with a specific binding partner, allowing rate-based as well as end point measurements. Presently, researchers use many different methods to determine protein concentrations including UV spectroscopy, Bradford, Lowry method and BCA (Bicinchoninic Acid). Each method provides different advantages and disadvantages. The Lowry, BCA and Bradford assay measure the total protein concentration in a solution. Comparatively, ELISA and SPR measure the concentration of a specific protein in a solution, allowing researchers to measure the concentration of a specific protein even in complex solutions. However, since ELISA is an end-point assay, many different steps are involved in the assay which makes it difficult to localize any errors that might occur compared to SPR. In addition, ELISA is more time consuming and expensive due to the consumption of more antibodies and the need for labels and the numerous wash and incubation steps needed. In addition to being an easy, fast and cost-effective concentration analysis technique, SPR can be used for many additional purposes. It is a label-free technology which allows researchers to quantitatively analyze binding between two biomolecules in real-time. SPR technology allows you to determine the kon, koff and KD of interactions, providing deeper insight into binding events compared to other techniques that only give endpoint measurements. 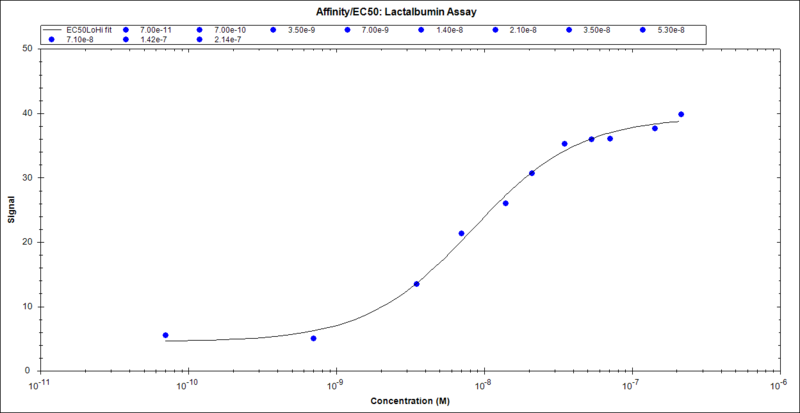 Below is an example of how OpenSPR™ can be used as a concentration assay for determining the level of α-lactalbumin in milk samples. α-lactalbumin is a 14kDa protein present in all mammalian milk. It is the second most abundant whey protein in human milk, and is often added to infant formulae due to its high nutritional value. Therefore there is a need for a concentration assay that can determine supplement levels in infant formulae, natural levels in bovine milk, and pharmaceutical levels in milk protein isolates. SPR provides a simple, fast and cost-effective platform compared to techniques such as ELISA as it doesn’t require labels, it obtains results in real time, and the same sensor surface can be used for many samples. In this application note, we develop an assay for measuring α-lactalbumin concentration using OpenSPR. The assay is able to measure the concentration of the protein from 15ng/ml to 1000ng/ml with excellent repeatability. The assay can provide the results of an unknown sample in under 5 minutes and can be fully automated using OpenSPR-XT, providing an excellent alternative to traditional ELISA methods. You can find the full study here.